Richard Christopher Davis was born October 19, 1950 in Amite, Louisiana. His innate appreciation for the beauty of the natural landscape is probably a byproduct of fulfilling the daily tasks of a farm boy on his parents' small dairy farm located on the upper Tickfaw River. Chris gives much credit to his Grandpa Ivy, a farmer and avid fisherman, for many of his fondest childhood memories - picking cotton with the farmhands; following in his Paw Paw's bare footprints in the cool dirt behind the plow-mule; searching the field for that first vine-ripe watermelon; or riding in the boat to check the hooks at daybreak - all images of an idyllic, simpler time which is the stuff good, uplifting paintings are made of. Chris attended a small junior college for two years and opened a successful sign business, beginning his acquaintance with paint and imagery at age 21. Becoming disenchanted with the commercial world after a failed marriage, he embarked on a "mission" to educate himself. Having read a book on the life of Van Gogh, and after a visit to the National Gallery, Chris decided to become an artist. Being totally self-taught, Chris considers himself to be a "polished country primitive" whose work appeals to an underlying spirituality of the viewer. "They feel what I feel. When I paint an image - we share." Chris lives with his wife Priscilla, in a home/studio they built themselves on the same ground he trod as a child, using his allotted time to sharpen his skill as a perceiving being and artist. They let me into the Governor's office in the MO state capital and I took photos of paintings of 4 famous Missourians by Gari Melchers. Am only attaching the one of Mark Twain for you, only one relevant to your site. 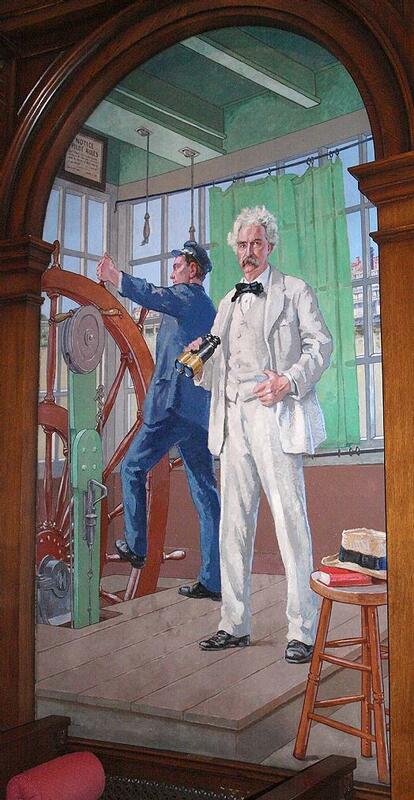 BY WAY OF EXPLANATION, THE FOLLOWING FROM BARB SCHMIDT'S TWAIN QUOTES SITE TELLS THE HISTORY BEHIND MARK TWAIN STANDING IN THE PILOT HOUSE IN THE PAINTING: In June 1902 Clemens paid his final visit to the Mississippi River when he accepted an honorary degree at the University of Missouri in Columbia and helped dedicate a steamboat named in his honor. He "preached" in the Baptist Church at Hannibal. At St. Louis, he made a speech (see the text below) at the dedication of the steamboat MARK TWAIN. TWAIN'S SPEECH AT THE CHRISTENING OF THE ST. LOUIS HARBOR-BOAT "MARK TWAIN"
The Countess de Rochambeau christened the St. Louis harbor-boat Mark Twain in honor of Mr. Clemens, June 6, 1902. Just before the luncheon he acted as pilot. "Lower away lead!" boomed out the voice of the pilot. " Mark Twain, quarter five and one-half-six feet!" replied the leadsman below. "You are all dead safe as long as I have the wheel--but this is my last time at the wheel." At the luncheon Mr. Clemens made a short address. FIRST of all, no--second of all--I wish to offer my thanks for the honor done me by naming this last rose of summer of the Mississippi Valley for me, this boat which represents a perished interest, which I fortified long ago, but did not save its life. And, in the first place, I wish to thank the Countess de Rochambeau for the honor she has done me in presiding at this christening. I believe that it is peculiarly appropriate that I should be allowed the privilege of joining my voice with the general voice of St. Louis and Missouri in welcoming to the Mississippi Valley and this part of the continent these illustrious visitors from France. When La Salle came down this river a century and a quarter ago there was nothing on its banks but savages. He opened up this great river, and by his simple act was gathered in this great Louisiana territory. I would have done it myself for half the money. - Mark Twain's Speeches, Harper & Brothers, 1910. Related story in The New York Times, June 7, 1902 contains a more extensive text of the speech. 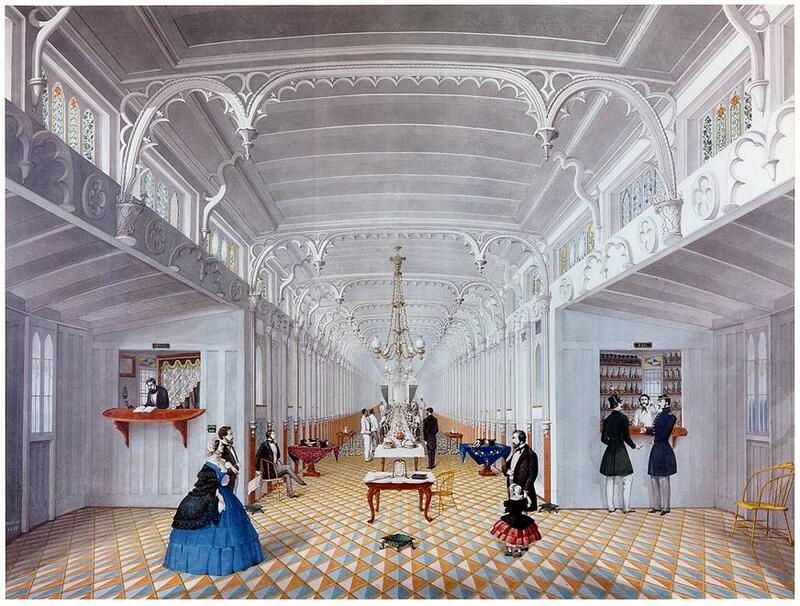 "The saloon of the Imperial represents the height of luxury of steamboating at the middle of the nineteenth century." Expanded history of the boat in the painting which was actually referred to as the EXPRESS No. 2 although "No. 2" does not appear after her name in photographs of the boat in the Murphy Collection. I formatted this scan of a print of Thomas Anshutz's painting of the EXPRESS, 1880 inside an oval vignette. Am not positive at the moment which collection owns the original artwork, it could be in the Ohio River Museum at Marietta, Ohio. Anshutz was born in Newport, Kentucky in 1851. He grew up in Newport and Wheeling, West Virginia and was co-founder of The Darby School of Painting and leader of the Pennsylvania Academy of Fine Arts. Two relatives of the artist worked on the boat during the 1870's, Captain Phil Anshutz and Clerk, E.J. Anshutz (see below). Thomas apparently painted this boat "in memoriam" for the EXPRESS No. 2 in 1880 since she had been retired and dismantled the year before (1879). "In the Wheeling-Parkersburg trade; teamed up with the sidewheel Courier. After she was dismantled, her hull served as the wharfboat at Wheeling until the Crockard and Booth wharfboat was built at Moundsville in 1892. Her machinery and whistle went to the St. Lawrence." Elsewhere in this wing of the steamboat.com museum you can see Tommy Thompson's painting MAJESTIC PASSAGE (of the steamboat VIRGINIA on the river at New Orleans) and his painting of the steamboat CARNEAL GOLDMAN on the river at New Orleans. 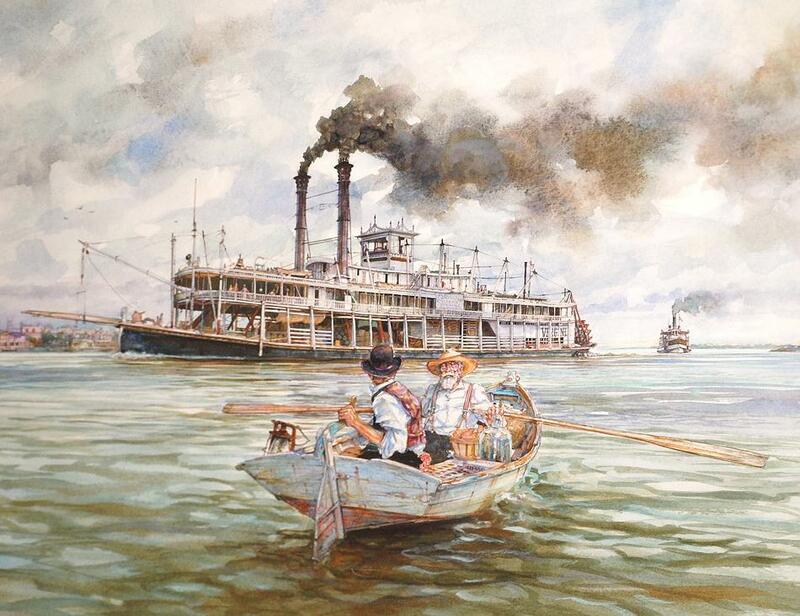 Attached detail of Tommy Thompson's 1990 painting of the VIRGINIA at New Orleans that he entitled "MAJESTIC PASSAGE." I bought the original from Joan Liberty in New Orleans back in the early 1990s. 19 3/4 X 23 3/4 original oil on canvas by Wilhelm (see below for a biography of the artist). Several of Wilhelm's paintings were on Reflector covers in the past. Acquired from from Dave Dugas' Le Petit Solider antique shop on Royal Street in the early '90's. After spending a lifetime perfecting his skills as a premier ship modeler, Wilhelm turned his attention to full time painting at the age of 51. 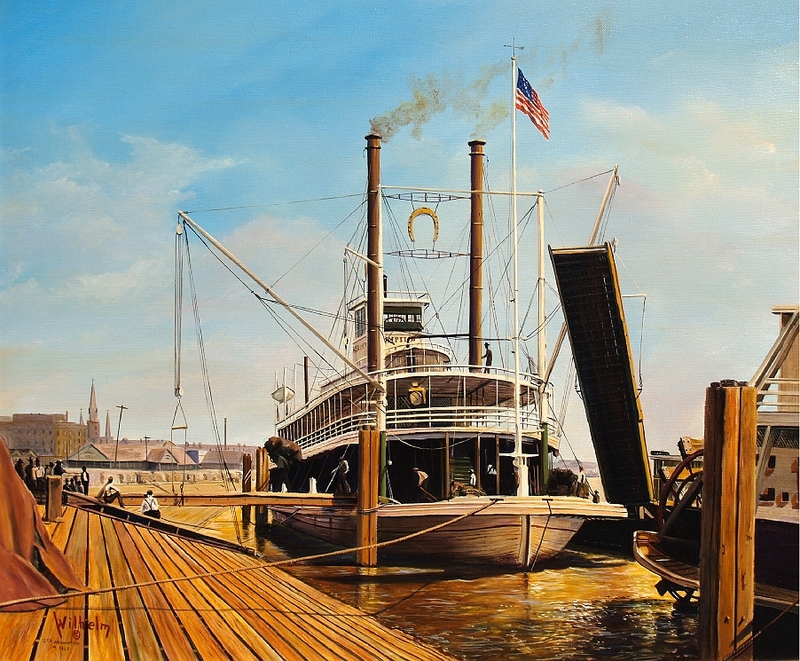 Influenced by a childhood spent along the Mississippi River, he started painting harbor scenes that depicted the character and romance of the great merchant vessels of the 50's. He then added painting trains which he personally researched and visited the areas. Through his early work in modeling, Wilhelm developed a feeling for scale, proportion and detail that lended a distinctive sense of realism to his paintings. 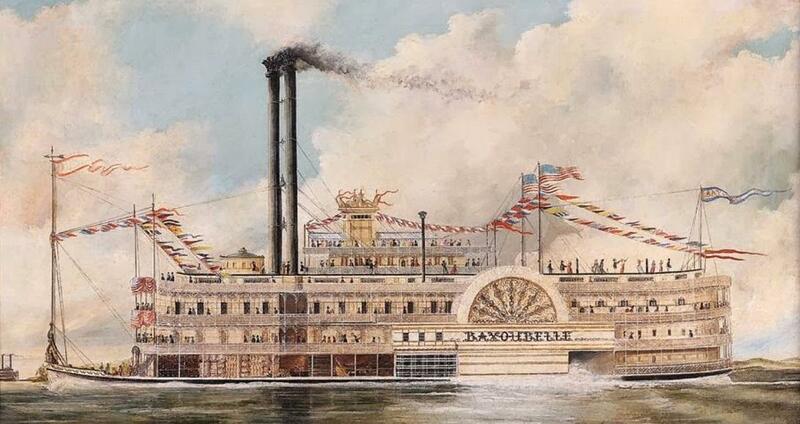 A native of New Orleans, Wilhelm saw his first steamship when he was six years old. "My father took me to the docks to see a British cruiser and the U.S. battleship ARKANSAS," he recalled. "I remember well holding his hand crossing the street, the ships blocked from view by the freight sheds, with only their masts towering above. We waited for a steam engine with some freight cars to go by, and then walked out on the docks to a breathtaking sight. I had found my true love." Wilhelm was a member of the Steamship Historical Society of America, and painted commissions for steamship companies, covers for magazines, and portraits for ship lovers. Paul Detlefsen (1899 - 1986) was a gifted artist who created matte paintings for Warner Bros.' 1944 "biopic" THE ADVENTURES OF MARK TWAIN among other titles and during his 20 years with Warner's became head of the studio art department. Beginning in the early 1950's Detlefsen embarked on a series of nostalgic Americana paintings (published as framed prints and on calendars, playing cards, you-name-it) that represented landscapes with vintage style structures and themes like "down by the Old Mill Stream," a blacksmith shop, covered bridges, a fall color scene with a boy and his dog trailing behind a herd of cattle on their way to a barn. Children running happily home from their one room school house; horse drawn vehicles like an old time fire engine being pulled full tilt to an emergency; a splendid Victorian depot which looked like it inspired the mansard roofed depot at the entrance of Disneyland. Old time diamond stack locomotives hauling passenger cars were also a favorite subject to the artist. 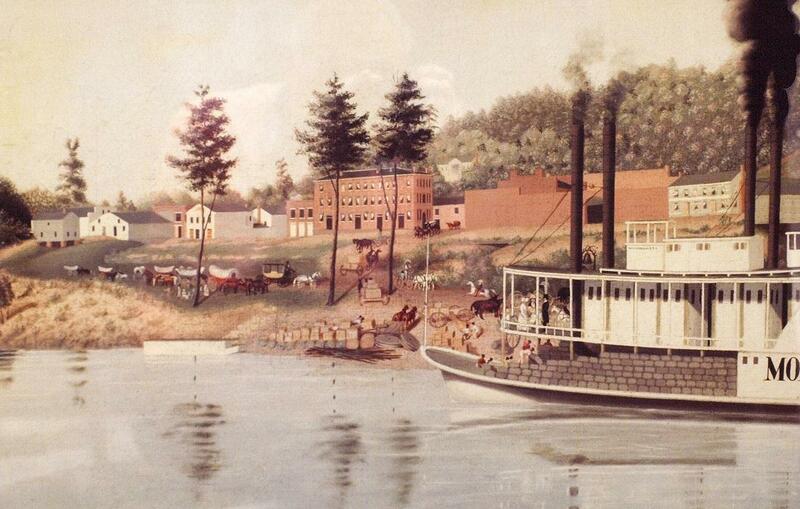 Attached Detlefen's painting RIVERBOAT DAYS of a generic packet boat that he named GARY WAYNE; a couple of Tom 'n Huck-type boys fishing from a dock in the lower left corner. Illustrator Andrew Loomis seemed to have derived the steamboat in his steamboat painting which we have posted among our other Illustrations. Very early frontier-flavored painting with Contestoga wagons, stage coach and other horse drawn vehicles. Commercial buildings and homes, fascinating glimpse of what it was like in very early days on Southern rivers. 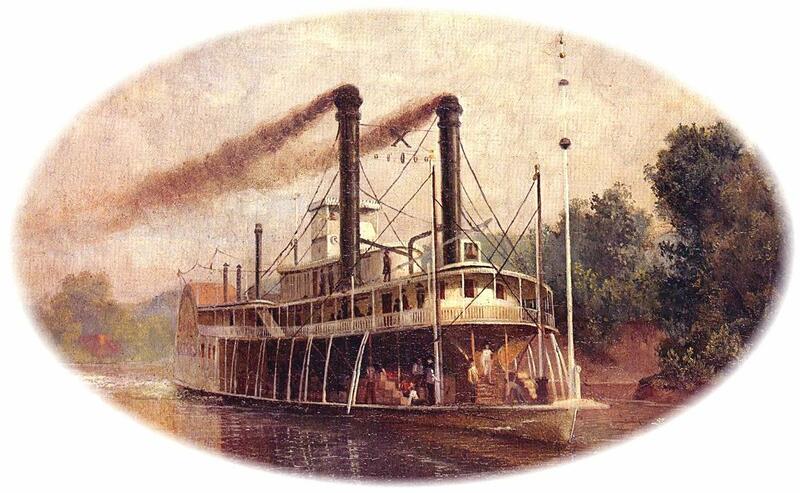 Steamboat MONTGOMERY on the Coosa River at Wetumpka, Alabama. Built at New Albany, Indiana in 1843. 407 tons. Went to Mobile, Alabama. 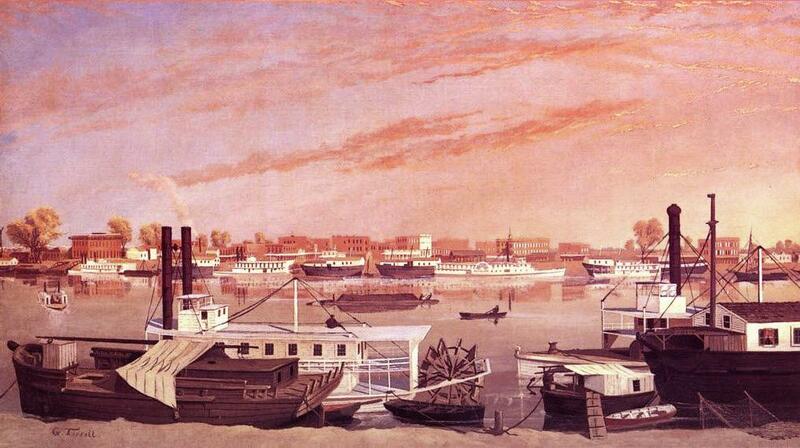 Returned to New Orleans February 1850. Capt. J.H. Estes of Mobile was master, and she was owned at Mobile by John G. Owen and F.M. Johnson. Burned at New Carthage, Mississippi, 33 miles below Vicksburg, Mississippi on November 7, 1851. 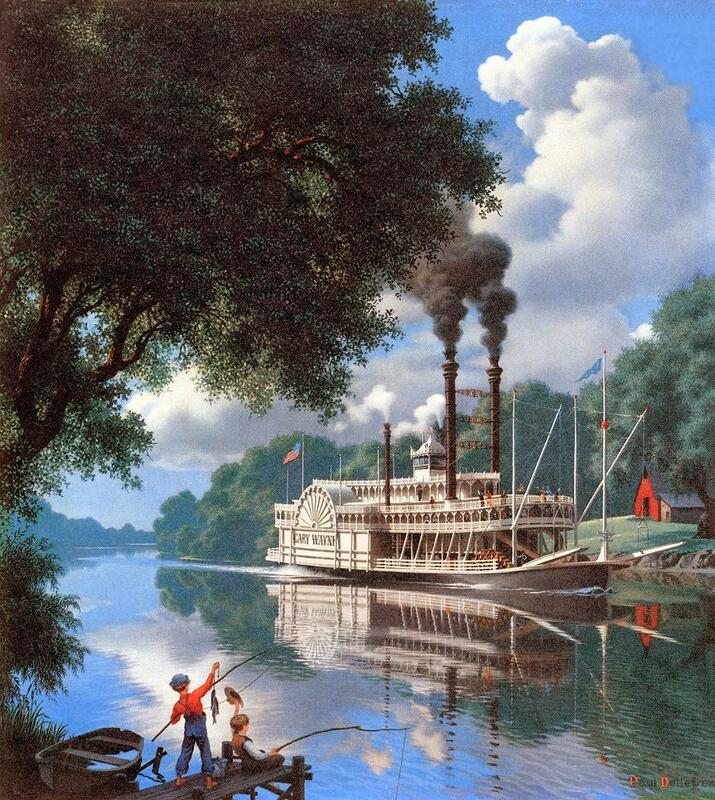 One of my all time favorite river/steamboat paintings. 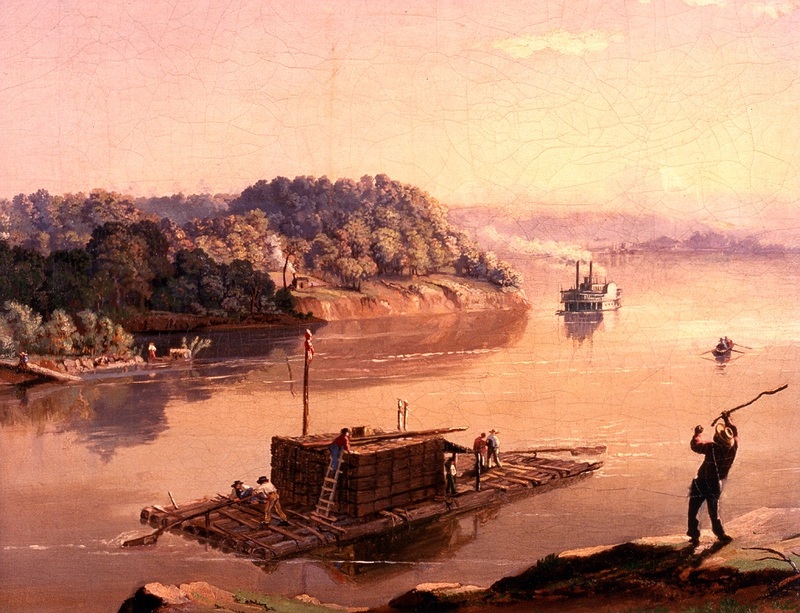 Since it was painted back in "antebellum times" it was by an eyewitness, not a scene imagined by a modern painter who never saw that raft and that steamboat. The river has that thick coffee with cream look which is characteristic in certain seasons or when the sky is not reflecting blue on the surface on the Mississippi and Missouri. The gentleman in the lower right hand corner seems to be literally "raising cane" and perhaps yelling at the raftsmen down below who don't appear to be paying any attention to him. Lewis Verduyn who is a rafter on the Clutha River in New Zealand says that the raft is authentic. I can't tell if those are crates or milled shingles for roofing stacked in the center of the raft. This is a very special and rare work of art, wish we knew the painter's identity. The style suggests they were from Europe or were schooled over there, there's a classical style to it. Attached file of a fascinating painting created just before the Civil War. The steamboat on the left doesn't have visible engines or pitman arm connected to the sternwheel. Out of the ordinary. The colors were considerably "hotter" so I de-saturated them here to cool 'em off. Image of an item listed in a 2013 catalogue from New Orleans based auction house Neal Auction Company. This painting looks like it was done over a pencil drawing on a smooth surface like "Masonite." There's a sort of fantasy-world style to it with all the bunting and flags fluttering and the windows in the pilot house are so narrow in height that they look like transoms that are usually featured over doors. 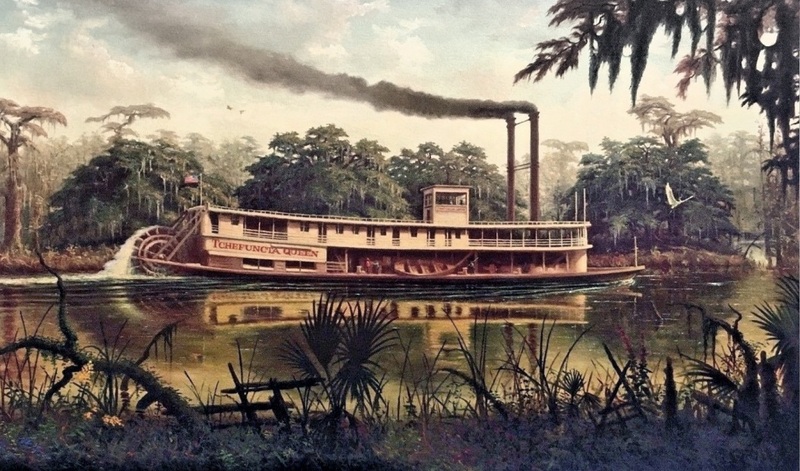 There was a sternwheeler named BAYOU BELLE which operated on the lower Mississippi from 1855 to 1860 but since the boat in this painting is a sidewheeler it couldn't be the same vessel, suggesting that it was a generic fantasy of a steamboat based on the Currier & Ives lithograph of the MAYFLOWER. 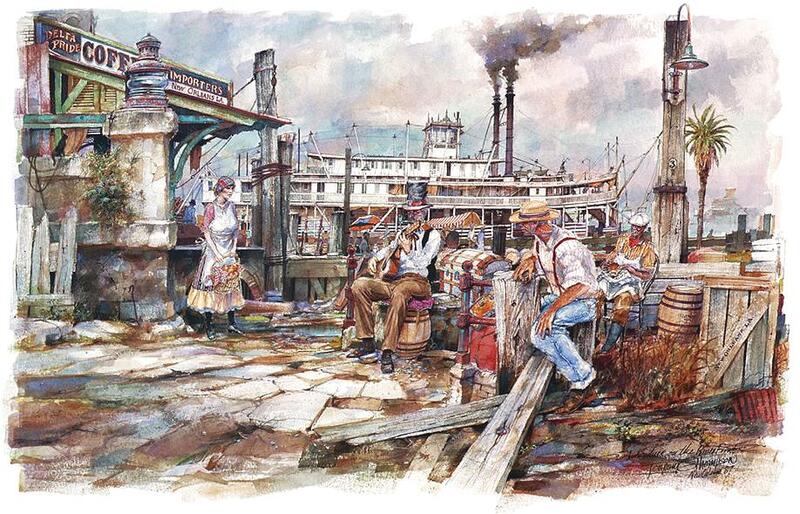 A St. Louis dining establishment called the Bayou Belle Restaurant was housed in a land bound retired sternwheeler named WHITE SPOT that was built around 1900. A cookbook written as a tribute to the restaurant entitled "Bayou Belle: memories and recipes" by Jean Koprivica Surrisi and Dorothea L. Wolfgram was published by West Wine in St. Louis in 2001.